When the topic of converting one-way streets to two-way, there's always a comment made about needing the one way streets for the on- and off-ramps to the Inner Dispersal Loop. I completely disagree, and have spent some time working on a map to show how it's possible to make Cincinnati and Detroit two-way streets, as an example. There are some trickier areas like E. 8th Street, but there's always a workable solution. That'll be my next project. And what is the great benefit for eliminating the one way streets near the IDL? I guess I don't clearly see the problem that the solution addresses. How do you handle where Detroit/Cincinnati merge past Standpipe Hill? These areas are often cited as reasons why we can't convert more streets in the rest of downtown. "Well, we can't do Cincinnati or Detroit, we can't do E. 2nd Street or 8th Street", and it leaves downtown with its current mix of one-way and two-way streets that confuses out-of-town drivers (not just the suburbanites, but the OKCers, Kansas Citians, Wichitans, etc. as well. Some downtown business owners have indicated the one-way streets have deterred their own existing clientele. And we all know the problems associated with one-way streets: encouraging higher speeds, making it more dangerous for pedestrians, which in turn makes the area less walkable, etc. Installing traffic signals would be the easiest way to handle it, but a more creative solution would be the installation of a roundabout. 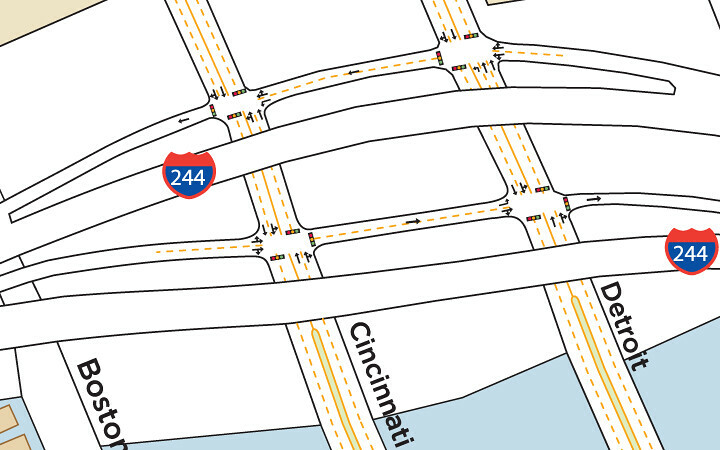 Edit: There'd have to be some lane modifications on Cincinnati. Let me work on it and I'll post another map later. Fair enough. I'm of the opinion then, that if it is a nuisance and no one likes it, change to two way and deal with a more solvable group of problems. Is it city engineering that is hesitant to change them? I would be happy if we made everything two way, but I'm OK if Cincy and Detroit continue as they are. The one way situation on these streets from 244 to 51 does help the commuters get out of Dodge quickly. Everything else, Main, Boulder, Cheyenne, 1st, 2nd, 5th 6th and 7th need to be converted to two-way. Isn't that something we'd like to slow down? Converting these to two-way isn't going to create traffic jams, it'll help slow down the traffic. I've often been on Detroit at 5:05 p.m. and though people are going 45-50 mph (which is dangerous enough), it's not congested at all. In fact, it's pretty sparse. And we also have entrances to the IDL on all sides of downtown, so I doubt this is going to bottleneck anything. I've never understood the complaint that one-way streets confuse visitors. Every good downtown I have visited had one-way streets. Are our visitors uniquely stupid and easily confused? If we leave the IDL entry/exists as one-way, aren't we just talking about 1st & 2nd, Cincinnati & Detroit, and 7th & 8th? Maybe we just need better signage on the one-way streets we keep. I like the idea of keeping some of the one ways, reducing them down to two, maybe three lanes, widening the sidewalks and putting in real bike lanes. Are our visitors uniquely stupid and easily confused? Most of the DT visitors are from areas just outside Tulsa. Perhaps? They weren't always one ways. I used to feel the way you do but the reality is that drivers are less patient, less willing to read road signs and drive way too fast. I am skeptical of roundabouts for the same reasons. But, it keeps the city crews busy and the road contractors employed. BTW, we pay those Negroes to amble around to keep the suburbans moving right along out of town. Same thing with the scragglies. Local secret. Part of the problem in downtown Tulsa, though, is that there are very few crossings between the Brady District and the rest of downtown as it is. If we want true connectivity between the Brady, Blue Dome, CBD and BOK Center/One Place, we need more two-way connection points. There are many instances where an out-of-towner (or perhaps even a local) could become very disoriented, especially if trying to access any of those areas from the Brady District. If we want people to stay downtown, they have to feel comfortable that they can get around easily. The above street access stuff is a lot of information to retain, and if you're not from the area, it could cause a lot of frustration.